Toner & Ink.. Not the same thing! Often heard used interchangeably, these are actually two very different things with the same purpose. Ink and toner are the materials that are used to create any printed image, but with different techniques and outcomes, kind of like the difference between writing with a marker and writing with a pen. Ink is used in inkjet printers for basic personal printing, like for home and school use. Two Types of Ink… It matters! The dye is absorbed by the paper which provides bright, vivid colors, which is very good for color printing photos. Unfortunately, it can fade when left in sunlight for too long and smear when it gets wet. These are made of resins (organic molecules that plants secrete) that are ground into small particles. Pigment based ink sits on top of the paper instead of getting absorbed like dye inks, which gives the print less vibrant colors. However, it is fade resistant, and is also resistant to water. This is typically used for printing documents. Toner is most commonly used in laser printers and copy machines, which are usually found in a busy environment like workgroups instead of just at home. They’re required for fast, high quality, high production printing. Toner is typically made of electrically charged dry carbon powder that is contained inside plastic cartridges. These powders can either based with carbon or based with organic dry granules with polymers. When printing, the toner sticks to the paper through a heating process where the toner melts and binds to paper fibers, which makes it hard to smear, making it usually of higher quality than inkjet prints. 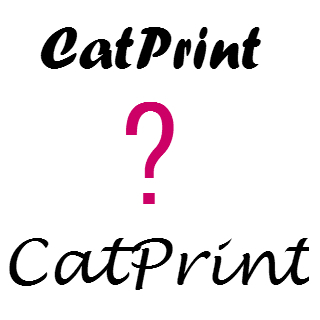 Now you have a hint as to why your prints at CatPrint look so amazing! If you have yet to place an order with CatPrint, you should do so today! Here’s one of the very special things about CatPrint: you can put your entire order on hold and receive a free hard copy proof if you want to see what your print will look like before your entire order is printed. Click here for more information!